It’s the beginning of a New Year, a time when many people make New Years resolutions to “whip themselves in shape”, “go on a detox diet”, or take extreme measures to somehow “improve” themselves. Unfortunately, statistics show that 92% of people who make health and fitness New Years resolutions fail to adhere to their plans within 30 days of the New Year*. Why do so many people struggle to achieve long-term health and fitness? Should we all just skip the gym, ignore our personal trainer, give up, and park ourselves on the couch? Self-Acceptance Is The Key To Fitness Success: This may sound counter-intuitive at first; if you’re overweight, or unhappy with an aspect of your life, it can be difficult to accept yourself in your current state. However, we think that self-acceptance is the first step to becoming the best version of your self. B) List the ways you show yourself appreciation: When you have determined what you love about yourself, and taken time to be grateful for those traits, list the ways that you show yourself appreciation. 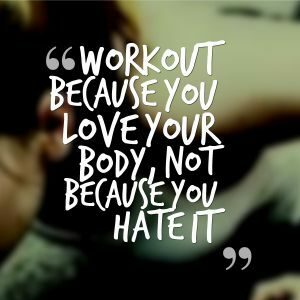 How do you treat your body every day? This will be an ongoing effort, but we promise that spending time being grateful and showing yourself appreciation every day will be rewarding. When you really love yourself, no matter what you look like, or how physically strong, weak, fat, or thin you are, you can begin to show yourself appreciation and respect. Taking care of your body, with a healthy diet, regular exercise, and regular doses of gratitude is an extension of self-acceptance. This year, we challenge you to seek self-acceptance. Don’t search for a “new” or “better” version of yourself. Find a way to value the old you, the same person you were yesterday. Accept yourself for the incredible person you are, and then show yourself some love by taking care of the only body you’ll ever have. Bootcamp is a great way to have fun with your friends! Bring a friend to Etobicoke’s best boot camp, Fit1 Bootcamp! All are welcome! Co-ed bootcamp is an energizing and inspiring way to find and maintain the motivation you need to achieve your fitness goals. Women Only Classes: Fit1 Women Only bootcamps at 9:30 am Mondays, Wednesdays, and Fridays are full of friendly, supportive and inclusive women of all ages and fitness levels. Customized Sessions: We guarantee that your workouts will be customized to your personal fitness levels so that you feel challenged but secure and you’re able to avoid injury. Personal and Corporate Training Available: We train individuals, couples, small groups of friends, and corporate groups of all fitness levels. Nutrition Consultations and Weight Loss Programs: We offer nutrition consultations, body fat measurements, and customized weight loss programs for people of all ages and fitness levels.